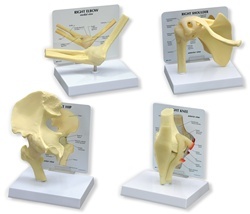 Each basic joint model includes a patient education card and a stand. These models do not articulate. * Full-size right hip with femur includes: articular capsule of the hip joint, greater and lesser trochanter, ilium, ischial spine, ischial tuberosity, ischium and pubis bones. Includes patient education card. Size: 5" x 4-3/4" x 8-1/4". * Full-size right shoulder includes: clavicle, humerus, and scapula bones, articular capsule ligament, teres minor tendon, plus additional ligaments and tendons. Includes patient education card. Size: 5-1/2" x 6" x 6". * Full-size right elbow bone model includes: humerus, radius and ulna, joint capsule, annular ligament of radius, oblique cord, radial collateral and ulnar collateral ligaments. Patient education card included. Size: 8-1/2" x 2-1/4" x 4". * Full-size right knee includes: femur, fibula patella and tibia. Lateral and medial meniscus, quadriceps femoris tendon, anterior cruciate, fibular and tibial collateral, patellar and posterior meniscofemoral ligaments. Includes patient education card. Size: 3-1/2" x 2-3/4" x 6".